In a Stogie Sprits article back in May, I took a look at pairing cigars with three styles of Sam Adams. As I said back then, contrary to a common misconception, a good flavorful beer can be an excellent accompaniment to a fine handmade cigar. And if you’re looking for such a beer I would certainly recommend Ommegang Abbey Ale. The beer can be found in many grocery stores for around $6 for a 750 ml bottle. While I haven’t seen anything to indicate this beer is actually from the Burgundy region of France (after all, it’s brewed in Upstate New York in a Belgian style), I don’t think the description is necessarily inaccurate. There are many qualities to this beer that are very wine-like. The beer has a deep ruby color and, when poured, it foams up and creates a tan, cappuccino-like head. The brew is highly aromatic, with deep fruit flavors similar to a fine red burgundy. The taste is malty with fig, sweet cherry, and toffee flavors. You’ll want to pour it into a goblet as opposed to a pint glass to maximize the flavor and aroma. Ultimately, this is a fine beer that would pair well with a medium- to full-flavored cigar. While I would suggest avoiding a maduro, anything from the Fuente Hemingway line works well. I would also suggest enjoying this brew with a Don Kiki Brown Label, a Rocky Patel Sun Grown, or a Partagas Serie D No. 4. If you go to the Ommegang Web site, you can find out if they have a distributor in your state. Sounds good but never heard of it. Is it only sold in certain regions? Can it be purchased online? Excellent description of the beer Patrick! I guess your stogie trained palette is well equipped to operate in other realms! 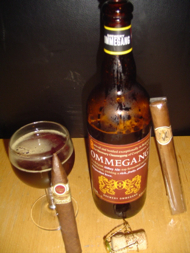 I got into beers before cigars, and know the Ommegang beers well. Belgian and Belgian-style beers are very flavorful and present many food-beer (and stogie-beer!) possibilities. Another option is the New Belgium Brewery out of Colorado. They make several Belgian style ales, sold in six packs, that are very good and priced about equal with other micro brews. A favorite standby of mine (being from the Bay Area) is Anchor Steam. It is malty, nutty, and metallic, and goes great with a Padron londres natural! yes yes yes! I drank two last night with a Perdomo Parejo. I love this stuff, and it's cheap too!